“Hear, O Israel: The Lord our God, the Lord is one. You shall love the Lord your God with all your heart and with all your soul and with all your might. And these words that I command you today shall be on your heart. You shall teach them diligently to your children, and shall talk of them when you sit in your house, and when you walk by the way, and when you lie down, and when you rise. You shall bind them as a sign on your hand, and they shall be as frontlets between your eyes. You shall write them on the doorposts of your house and on your gates” (Deuteronomy 6:4–9; all Scripture citations from the English Standard Version unless otherwise indicated). Image from pxhere.com. Published under a Creative Commons 1.0 Public Domain license. It is not enough to know that the Bible is the Word of God. God gave us His Word so that we could know Him, His will, and how to follow His directions for our lives. “And one of the scribes … asked him, ‘Which commandment is the most important of all?’ Jesus answered, ‘The most important is, “Hear, O Israel: The Lord our God, the Lord is one. And you shall love the Lord your God with all your heart and with all your soul and with all your mind and with all your strength.” The second is this: “You shall love your neighbor as yourself.” There is no other commandment greater than these’” (Mark 12:28–31). Since both Jewish tradition and Jesus Himself consider these verses to be so important, we should take heed to the rest of this exhortation. How can a child of God follow the teachings of Jesus? By knowing God’s Word. To know and follow God’s will for our lives, we must store His Word in our hearts. We also must pass it on to future generations. We need to read the Bible every day. We should read it alone. We should also teach it to our children. To grow in your faith, you should read the Bible throughout the week. It is not enough to simply hear the Scripture readings in church on Sunday morning. We need daily reminders of all that He has done for us and all He wants us to know. Also, our children need to hear the Bible throughout the week. The Bible never mentions Sunday school, children’s church, or a children’s sermon, because God commanded parents to teach their children. Read the Bible every day. Find a good Bible reading plan that will provide a passage for every day. I follow the Daily Office readings from the Book of Common Prayer. Many students of Scripture prefer to follow one of several “through the Bible in one year” plans. The devotional guide, Our Daily Bread, provides readings from the Old and New Testament every day to help you read the entire Bible within one year. It also provides a shorter reading with comments related to the passage. Train your children in the Word of God whenever you can. Young children (up to seven years of age) learn most from stories. Read Bible stories and explain what they mean to them. As a child gets older, you can read other books of the Bible, such as the New Testament letters, with them and discuss the passage. Teenagers should be encouraged to read on their own, perhaps following a devotional guide or other reading plan. Find teachable moments with your children. Deuteronomy 6:7 says that we should “talk of them when you sit in your house, and when you walk by the way, and when you lie down, and when you rise.” Discuss Bible passages that relate to things they learned in school or situations they or their friends are facing. Some families do a brief Bible study or prayer time while they eat dinner. See what works for your family. Finally, it is helpful to keep visual reminders about God’s Word and Christian truths around you. My wife will sometimes write a Bible verse on an index card and tape it to the bathroom mirror. That makes it certain that we will see that verse every day. This is especially helpful when the verse speaks about an issue that is important to you at this time in your life. We also have crosses hanging on a few walls in our apartment, reminding us of Christ’s sacrifice for us and His perpetual presence in our lives. If we believe that the Bible is the Word of God, we will not reserve it for one day of the week. Jesus said, “I am with you always” (Matthew 28:20), not “I am with you one day per week” or “I am with you only when you go to church.” He wants to speak to us every day. He wants us to share His good news with everybody—especially our own families. Seek His Word daily. “Behold, I will send you Elijah the prophet before the great and awesome day of the Lord comes. And he will turn the hearts of fathers to their children and the hearts of children to their fathers, lest I come and strike the land with a decree of utter destruction” (Malachi 4:5–6, ESV). Elijah ascended into heaven, but his legacy remains. Few biblical prophets share his prominence. 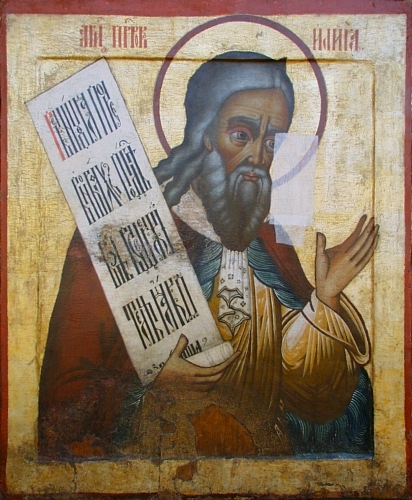 Although he did not write any of the books of the Bible, he is considered one of the greatest prophets in Judaism. Only Moses holds higher esteem. When Jesus was transfigured, Moses and Elijah appeared with Him (Matthew 17:1–8). Many students of end-time prophecy believe Elijah will return during the great tribulation before Christ returns. They believe he and Moses are the two witnesses in Revelation 11, mainly because the miraculous powers listed in that chapter are similar to theirs. The fact that they have power to shut the sky to prohibit rain (Revelation 11:6) points to some connection with Elijah. So, do we need the Elijah spirit today? Yes! Malachi 4:5–6 points out a major area where restoration is needed. This especially relates to Christianity in America. Divorce has become commonplace in America. The current US divorce rate is approximately 46%, which places it in the top 20 nations in that category. That rate has actually declined in recent years. However, this may be related to a steady decline in the per capita marriage rate. Since 1980, the marriage rate has steadily declined, and it is now at historic lows in America. So, in this case, a declining divorce rate does not suggest an improvement in the state of marriage in America. Many more people are choosing cohabitation instead of marriage, not expecting to stay together for life. 69% of children live with both parents, down from 88% in 1960. While we should applaud the efforts of single parents who are trying their hardest, statistics indicate that a single-parent home is usually not the ideal situation for children. Numerous studies show that fatherless homes are linked to increased probability of poverty, drug and alcohol abuse, suicide, criminal activity, premarital sexuality, etc. Let me emphasize that the final point refers to a general trend: Most single parents are doing the best they can. Many do a great job raising their children, and in some cases the children benefit (especially if one parent was abusive). Also, some people who grew up in seemingly healthy two-parent households end up making bad choices leading to addiction, crime, etc. Nevertheless, the statistics point to some disturbing cultural trends. A restoration of a biblical emphasis on family is necessary. It is no accident that the Old Testament ends with a promise that Elijah will restore the relationship of fathers and children. Our society needs this restoration: Churches should empower fathers to take a more active role in raising their children. When a father is not present in the home, mature men of God can assume a greater role as mentors and role models. The decline of the family will affect society for generations to follow. Strong men of God should do their part to restore the family as the basic foundation of society. In his time, Elijah stood up against the greatest sin in his culture: idolatry, from which numerous other evils sprang forth. The modern-day Elijah will have to stand against the modern-day idol of selfishness, which lies at the root of much of the family breakdown. It will require the moral courage of an Elijah, willing to stand even when he feels alone in the world; bold to defy the dominion of darkness that speaks through the voices of politicians, media, entertainment, etc. Without bold men and women of God, though, the future of the nation and society can be very grim. Copyright © 2017 Michael E. Lynch. All rights reserved.